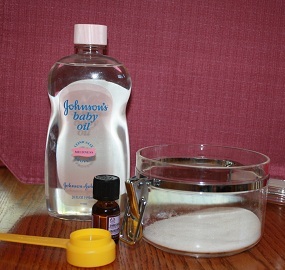 A Little Time and a Keyboard: Simple Sugar Scrub for a Spa Day! Simple Sugar Scrub for a Spa Day! We whipped up an easy sugar scrub this morning and pampered ourselves a little. With my daughter's attention span of about two seconds, we only successfully executed the sugar scrub. She was ready to move on before we could create any other spa treatments! In a few years, I am sure she will understand the importance of a little pampering! We mixed the ingredients in a small bowl. Then, we wet our hands and put a little of the scrub into our hands. We rubbed our scrub into our hands and rinsed our hands off in warm water. Next, we patted our hands dry and applied a lavender moisturizer. A nice little treat!